I finally found myself in posession of a pressure canner last week! 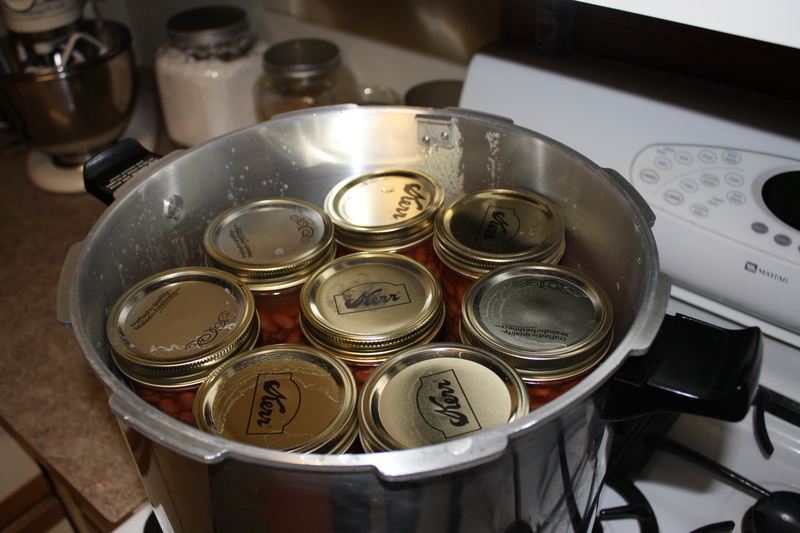 I have been dabbling in canning for a bit now and am constantly amazed by the produce canned by friends … who all say “It’s easy!” My ultimate goal was to can Lee’s venison, a worthy goal as the freezer has no more room after the moose and caribou has filled it to the brim and there are still more hunting trips planned. The timing was impeccable. I finally coordinated schedules with a fellow nurse and wonderful gal and she gave me my introductory lesson in pressure canning. That day we canned garlic cloves in olive oil. The next day we both worked and she ended up being floated from Med-Surg to the ER so we got to work together and she dropped the news on me: There is a 23-Quart Presto Pressure Canner on Craigslist for $50! I looked it up and emailed the seller to inquire it’s availablity. Why sure enough it was still available; it was brand new and still in the box, AND he would throw in a random assortment of canning jars for free! Uhhhh ….. SOLD!!! 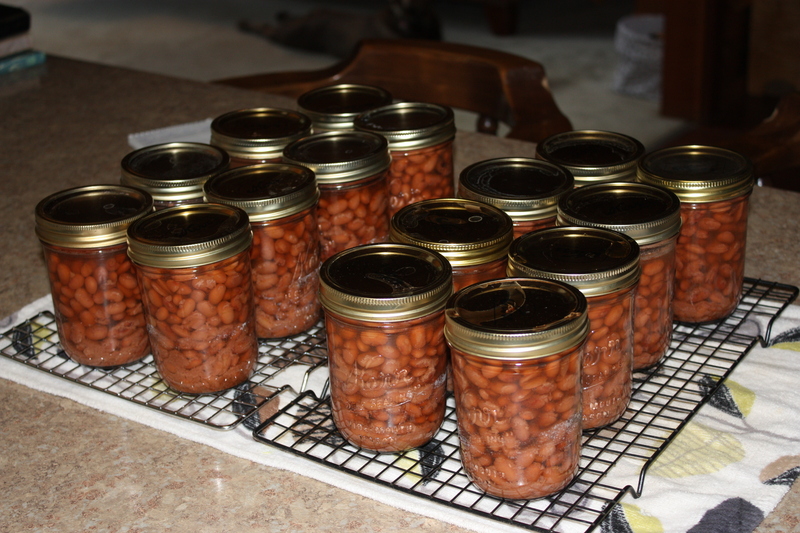 I decided to practice canning pinto beans. We/I eat a lot of beans and those cans start to add up and get expensive, not to mention the resulting stockpile of tin cans to recycle. I would rather ruin beans on the first trial run than venison. Alas, no explosions or diasters and 16 pints of beans ready for use! 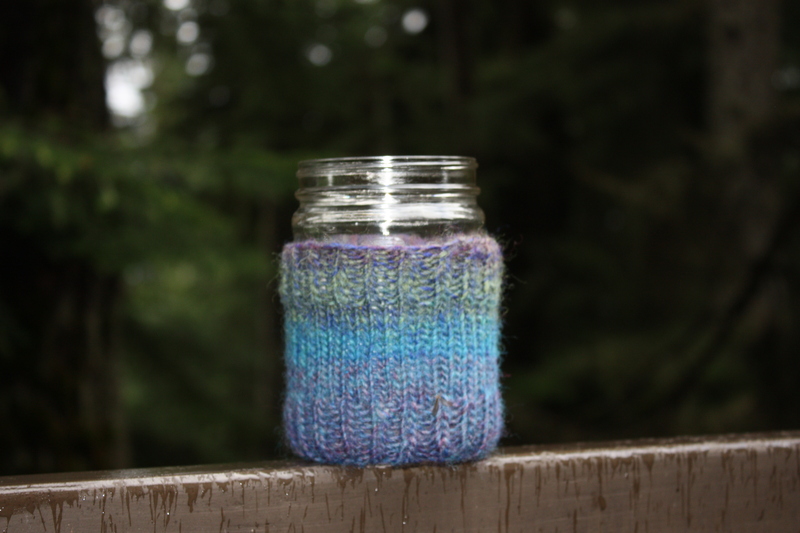 For those knitters out there who are now coveting my cozy, use up the scraps of yarn and make your own! Mine is a little different from the pattern because I ran out of yarn. 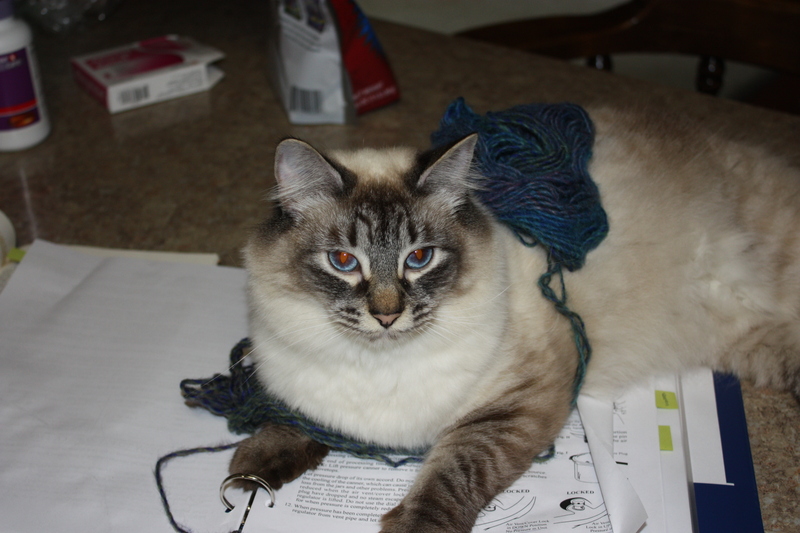 Amelia … ever so helpful and always ready to lay on whatever you are trying to read or study. 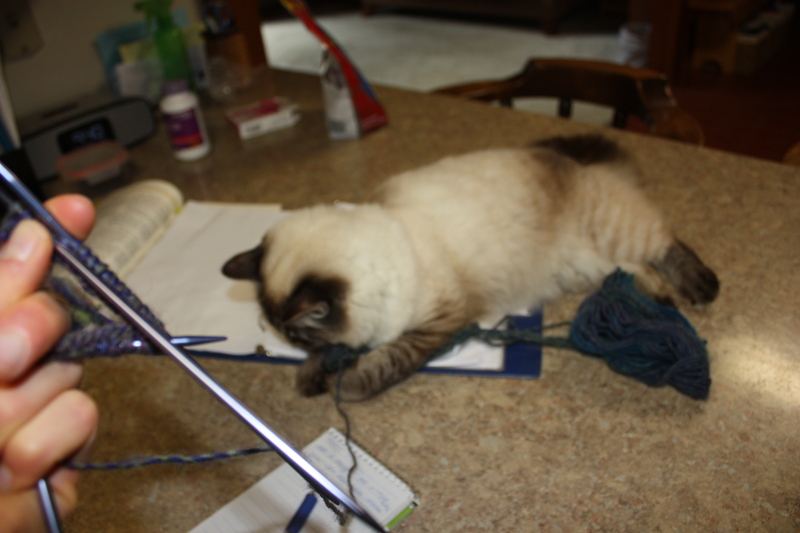 Loves the yarn too! Poor Neka, she developed a bad rash all over her belly and was miserable and itchy. We were treating her with benedryl every 8 hours. During the night Lee took her out to go to the bathroom and when he came back in I told him that she should take her next benedryl dose. He was already in bed and decided to wait til the morning to give her another dose … I fell back asleep and unbeknownst to me, he got up around 0630 and gave her a benedryl tab. 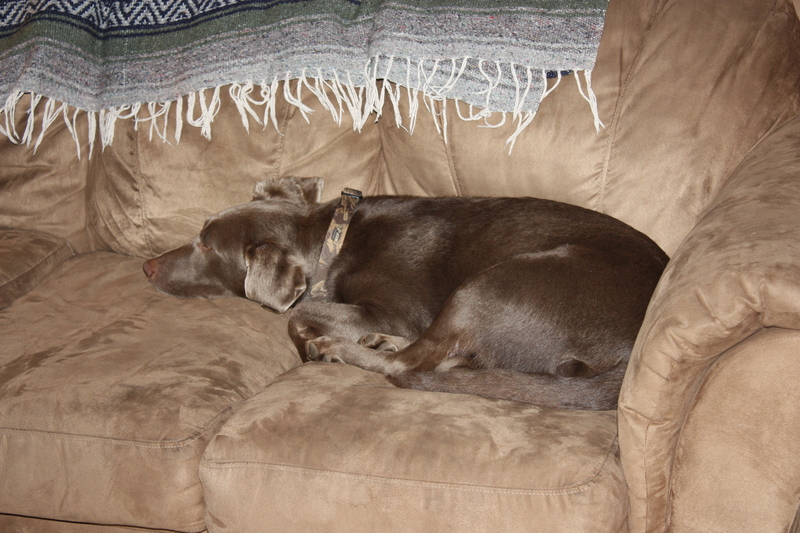 When I got up at 0730, I also gave her a benedryl having no clue that she had already had her meds just an hour before. Needless to say, this was her position of comfort in her overdosed state for the entire morning; she did little more than open her eyes when I would walk by. Poor Neka. Good job with the canning! You’ll discover lots of things to can., And just wait till next summer with lots of fresh fruit/veggies —- I know you’ll use your ingenuity, and will have lots of fun! Poor Neka! Doesn’t sound fun! And wow, those beans look great! And was it easy? Maybe I will have to look into that when I get home! ;Poor Neka!! 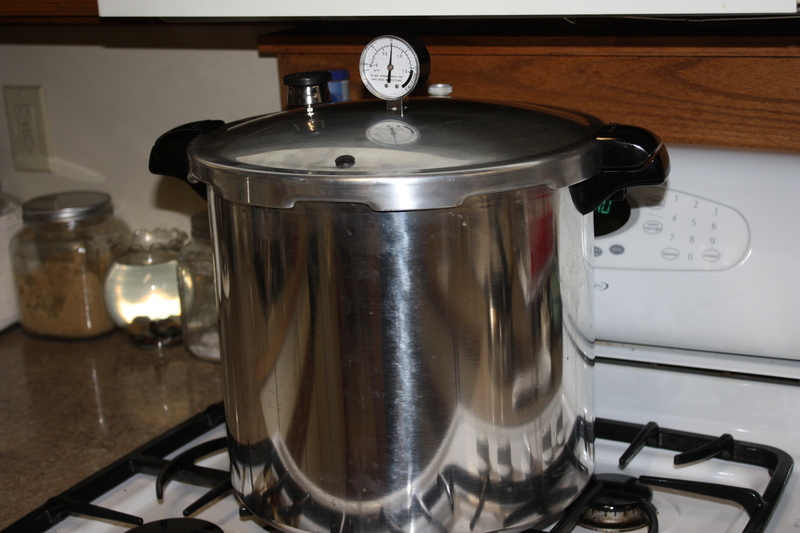 I never did any pressure canning…Guess why?? Because Grandma Hattie never did. Good reason. Glad you tried it. 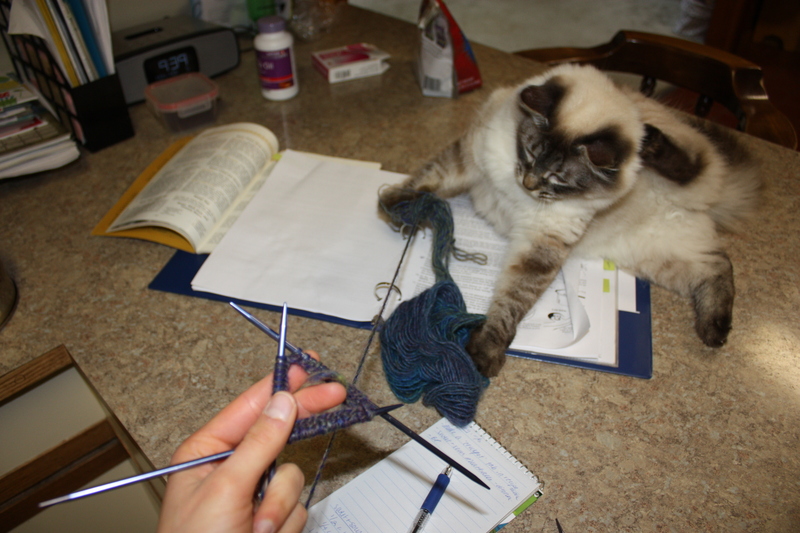 I do some things,,,, because Grandma did it that way…. Have fun.